The storm chasing season feels really far away, especially here in Sweden. While visiting a friend in Dubai we took a road trip during which I read Tim Vasquez excellent “Storm Chasing Handbook” on my iPad (to be reviewed later). The heat and the humidity really gave me the same physical sensation as in my chase tours. That plus reading about storm chasing really got me in to strong longing for this years season! Although my only way of chasing is through organized tours at the moment I really want to learn the fundamentals of storm chasing. My past guides have been bombarded with questions from me during my past three tours and I have learned a lot from them, but I have merely scratched the surface. Reading the “Storm Chasing Handbook” was a good first step and I learned quite a bit from it but it is after all a “Storm Chasing Handbook” and not “Storm forecasting for dummies”. So, I decided to take the next step in my learning and started off at StormTrack.org where there is a ton of non-organized (it’s a forum after all) information. Many adviced me to read the forecast discussion under the convective outlook at NOAA. It still felt quite a bit too complicated for my nearly zero experience in understanding weather forecasts. After some more forum threads and googling I found ExtremeInstability’s Storm Analysis 101. 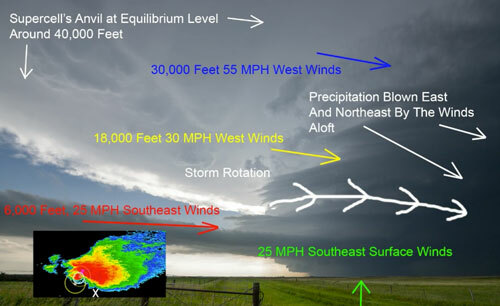 This is a set of three instructional videos aiming to teach the basics of storm analysis. It starts off in the first video set with an introduction to things you should know about storms ($10). This video is followed by two practical videos ($10 and $5) where you “chase along” with Mike Hollingshead (I think it’s him at least!). There are 2-3 chases per video and they are all discussed in terms of setup (approximately 20 minutes per chase) and the actual chase (about 40 minutes). The video set starts with an introduction to storm analysis. Courtesy of Mike Hollingshead, with permission. The chase videos are narrated and explained with an often present mouse pointer that shows you what part of the cloud, or radar image, he is referring to. This helps a lot, and so does the constant flipping between radar images, satellite images and the video shot during the actual chase. Watching these videos is like chasing next to someone who is really eager to teach you storm analysis. It has shown to be the best tool I have found so far in learning some forecasting but also understanding how to look at a storm cloud. I think I finally understood what a mesocyclone and an RFD notch is (not 100% sure though). Mike shows whats going on in the storm. Courtesy of Mike Hollingshead, with permission. The videos however, aren’t the “Storm forecasting for dummies” that I am looking for. It’s a great piece in that puzzle but it doesn’t cover all that I hoped it would cover. Many things remain difficult to understand and I think I would need even more, and better, graphical tools to truly understand everything from winds on a synoptic scale to the mesoscale. The scope of these instructional videos is not to teach you everything however and is not advertised as such. So, if you are a complete beginner (perhaps never been on a chase before) it may prove to be a bit too difficult to understand but it is still a great introduction to storm chasing and will make your first trip more interesting. If you have been on one or a few tours you will probably learn more from it. 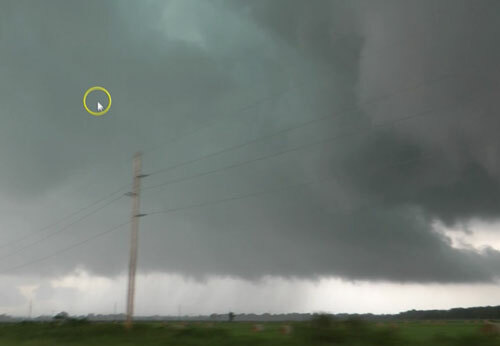 Altogether, I can truly recommend this video set for storm chasing amateurs (like me). It is the best educational resource I have seen, so far, when it comes to understanding storms from a chaser’s perspective. At $10+$10+$5 it is truly a bargain as well! If you, like me, live overseas it could be noted that you can download them from the web as well.